You might not want to drink rainwater, but there are plenty of practical uses for it. Population growth, prolonged periods of drought and an increased use of potable water for non-potable applications, such as toilet flushing and vehicle washing, all pose a very real threat to the continued supply of clean water. When you consider that in a commercial building only 9% of water is typically used as drinking water, it makes sense to consider water collection and re-use, particularly in new-build designs as a means of contributing to sustainable standards and ongoing environmental targets. There are many benefits to be gained from installing rainwater-harvesting systems in commercial premises. In addition to reducing mains water usage and resultant utility costs, it is a great way of reducing overall water wastage and boosting a building’s green credentials. In light of the recent floods, it is also a means of reducing the volume of surface water entering the environment in times of heavy rainfall, while storing plentiful supplies for use during dry periods. The principles of rainwater harvesting date back to Roman times, with the first of the modern day systems installed in Europe well over 30 years ago. Captured rainwater is filtered, and in some applications treated, to be supplied on demand to a number of outlets around the building for purposes such as toilet flushing, laundry, vehicle washing, irrigation, and cooling systems. Polypipe’s Rainstream RXL system can be installed with a single-size granular backfill rather than being supported by concrete. The storage vessel is typically a large tank which can be included within a building, surface mounted externally or buried underground. Tanks can range in size from 10 m3 up to hundreds of cubic meters. Depending on the system, a control unit can also be installed to monitor water levels and demand and top up with mains water if required during dry periods. Most people are familiar with traditional GRP sub-surface tanks, which are generally installed with a concrete support structure and filled with water during the installation process. However, thanks to advancements in technology and manufacturing, there are now more design and installation options for those looking to install a rainwater harvesting system. 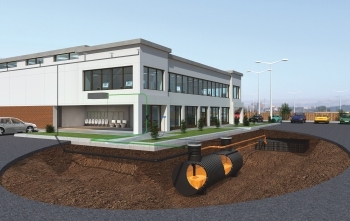 At Polypipe we have invested heavily in this area, taking underground tanks into a new era with our high- density polyethylene Rainstream RXL tank systems. Unlike conventional GRP tanks, RXL systems can generally be installed with a single-size granular backfill as opposed to a more costly and time-consuming concrete support. Further, they don’t need filling with water on installation, saving tens of thousands of litres of water — providing the opportunity for further cost savings and environmental benefits. On a practical level, RXL tanks can be stored easily off-site until needed in line with construction schedules. Its lightweight modular construction makes access to even restricted areas easier, negating the need for specialist vehicles and equipment. Rather than it being a standard system, our in-house fabrication teams make all of the profile strengths, pipe stiffnesses, fittings, bends and chambers to order, so customers benefit from an engineered cost-effective solution. This way you can achieve a whole host of design possibilities which complement the individual building’s shape or available space on-site. Harvested rainwater can be used for many purposes in a building. Depending on the application, there is the option to specify anti-microbial tank linings that resist the development of bacterial colonies on the tank wall. We also offer titanium disinfection systems which use a combination of UV light and titanium-dioxide technology as a sustainable, non-chemical alternative to chlorine or chlorine dioxide. No two rainwater re-use system requirements are the same, but a number of elements are common. The operating principles are largely standard. Rainwater is captured and collected, filtered, stored and treated for use. A backflow prevention device stops the backward flow of contaminated water from the sewer. Our commercial rainwater harvesting systems are designed in accordance with BS 8515:2009 Parts 1 and 2, and they are suitable for a whole host of applications — including schools, office blocks, warehouses, hotels, retail parks, industrial plants and multi-occupancy venues. We also have a team available to deliver our RIBA-approved CPD session on rainwater harvesting and re-use for sustainability to interested organisations. Ian Crickmore is technical director at Polypipe Terrain.